Artist Statement: I make art quilts to capture a particular feeling of special moments, places and people. 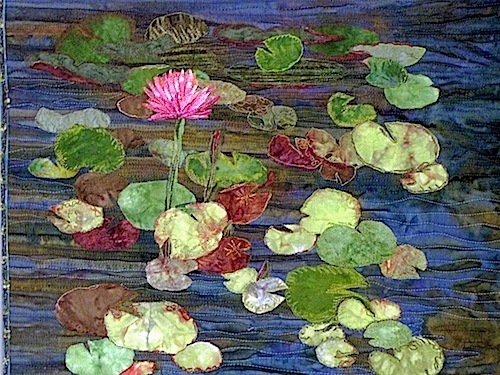 Creating art quilts and other mixed media art is a soulful need. Most of my work begins with an inspiration photograph which I have more of than time! My inner voice always tells me when, where and how to create – most often I work in my studio, a former bedroom converted to a bright and happy space Living in Michigan, I relish the days that I can create outside! I use a variety of materials - primarily batiks and hand dyed fabrics, tulle, a variety of threads, yarns, acrylic paint and found objects. I enjoy experimenting with new processes, sharing and learning from other artists. My work conveys a feeling of peacefulness and serenity. My art defines me, drives me, pushes me to try new things and gives me an avenue to share my love of teaching. I teach workshops in landscape art quilt design and construction locally and in Northern Michigan.